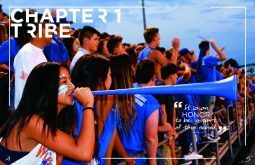 These outstanding spreads, images, graphics and more from 2018 yearbooks will make you stop and take a second look. 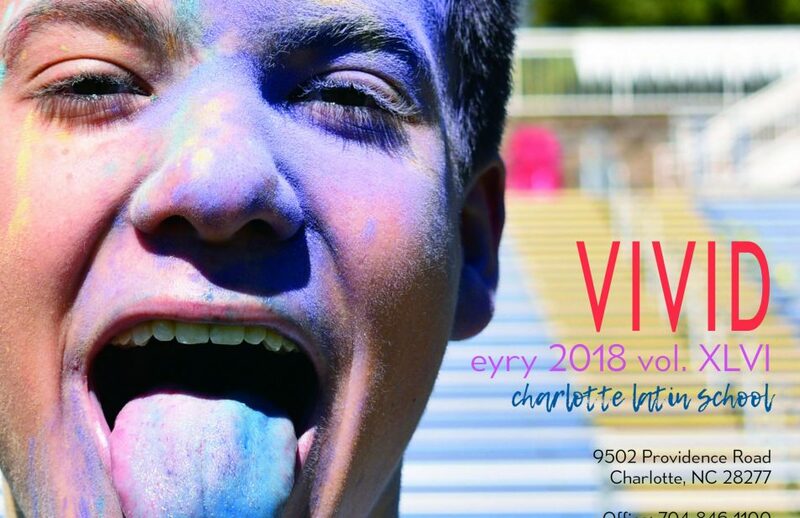 Your next yearbook idea is waiting here. 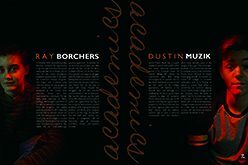 The dividers in the 2018 Pyromania feature two students on each spread. 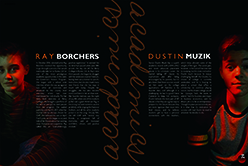 Portraits of the two students, using dramatic studio lighting and colored to match the divider theme’s colors, flank short copy blocks on the students and their story relating to the upcoming section of the yearbook. The treatment of the photos and the short stories add additional coverage of students who excel academically, athletically and socially. Finding an extremely strong photo to put at the front of the book is a gold mine. The Wah’kon-Tah staff found just the right photo to begin chapter one of their book. The color of the sky even turned to Westlake blue for the photo. 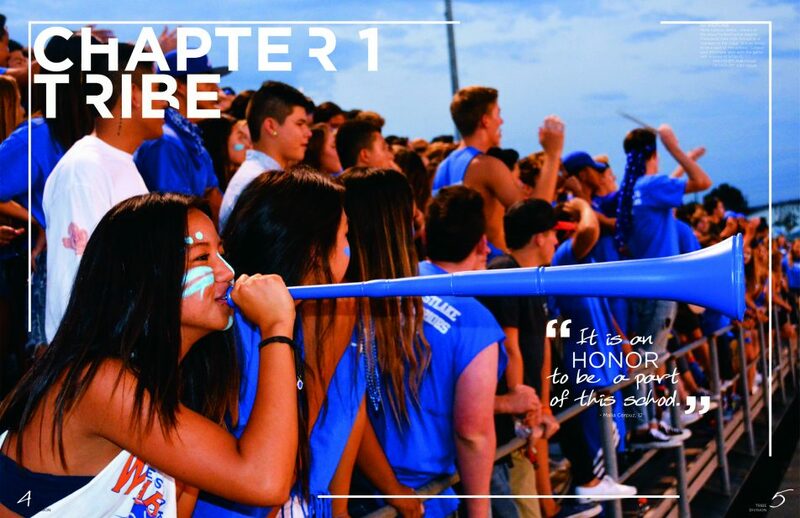 The only face clearly visible is the girl blowing on the vuvuzela with all the action of the photo and the faces turned toward heading into the book. 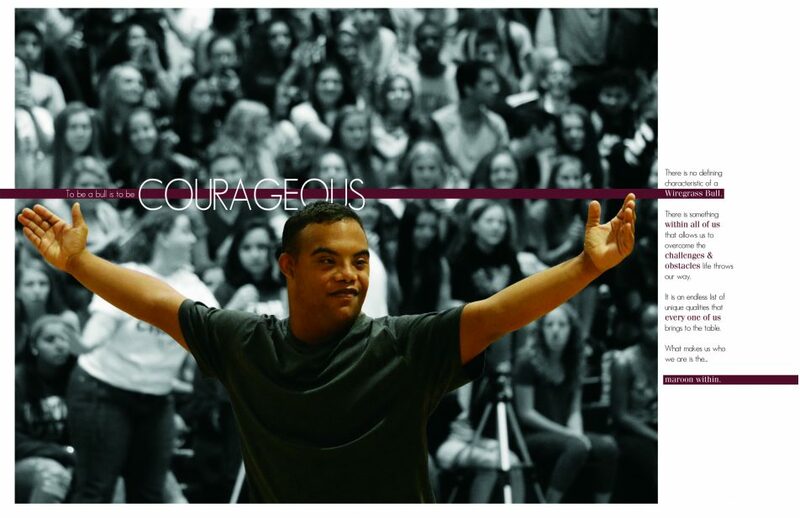 This is a beautiful photograph and a great start to a great yearbook. 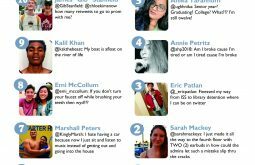 The staff members of the Chamhian selected the top 10 tweets of students at their school to highlight in the index. 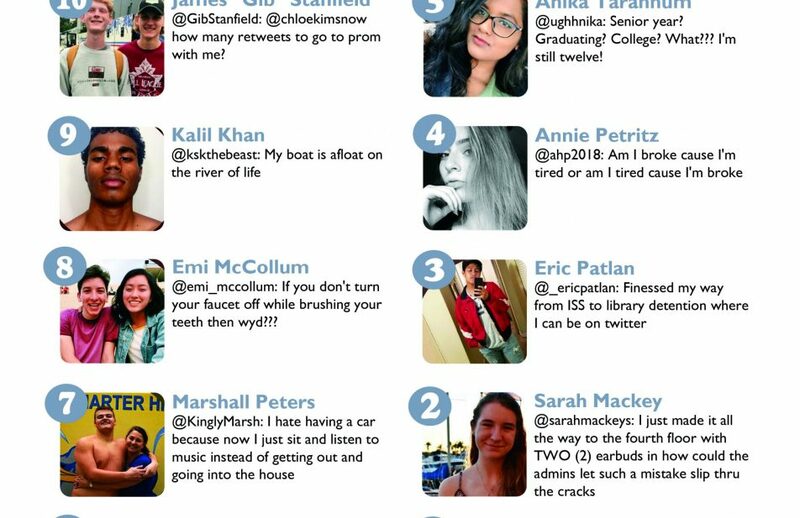 With easy access to the number of likes and retweets, it wouldn’t be too difficult to find the top 10 tweets of the year. The same could be done with Instagram photos or Facebook posts. Look up the most liked photos and posts from the year and get the story behind the scenes for a great look at the social media scene at the school. Once a school has been in existence for a while, there are chances that some of the students may be the children of graduates of that school. El Oasis found students whose parents, aunts and uncles attended the school. Photos of current students holding up yearbooks from their relatives’ graduation year highlight the spread. There are even some teachers mentioned in the story who had both mom or dad and the current student. 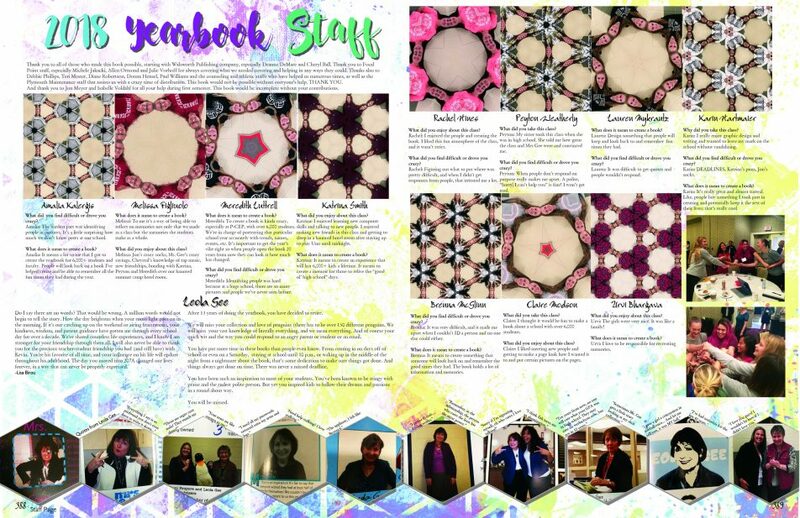 The 2018 Trinity chose “Kaleidoscope” as their theme. They carried the theme throughout their book in words and visuals. 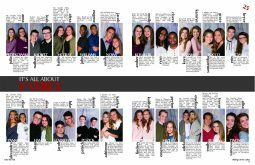 Near the end of the book, on the yearbook staff spread, the staff had some fun with their photos using a kaleidoscope filter. It has the effect of looking at the individual staff members through a kaleidoscope and is a fun way to end the book in a whimsical, thematic manner. As the United States grows more diverse as a nation, so do our schools. The staff of Wolf’s Eye at Oswego East looked at that diversity as a strength in their coverage of clubs. 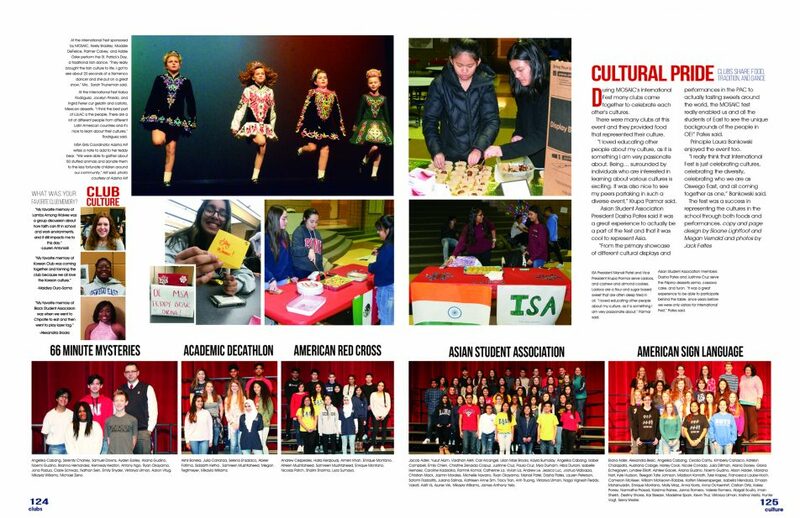 A look at cultural pride through Irish dancers and clubs such as the Asian Student Association and Indian Student Association help spread a positive image of a diverse student body. Something many yearbooks steer clear of is failure at their schools. People don’t like to read about failure. 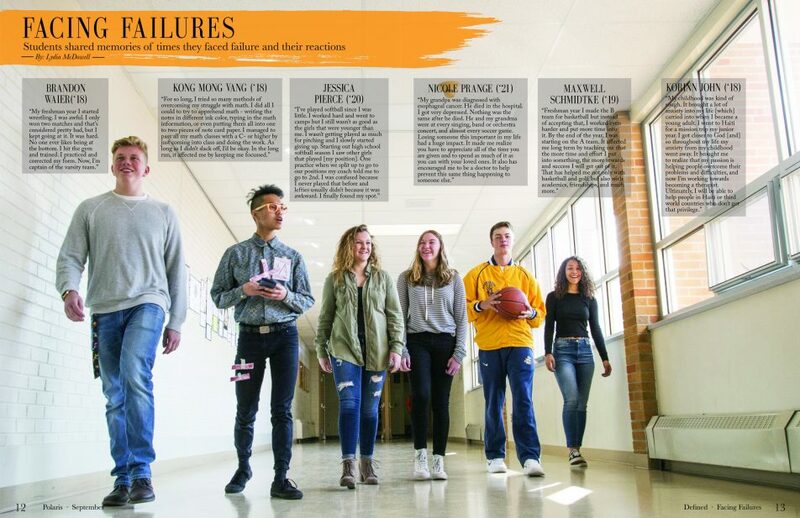 That didn’t stop the yearbook staff at Sheboygan North from talking to six students about their failures and the lessons they learned. The photo, shot from a low angle in a well-lit walkway, is a nice touch visually. Failure is a part of life and learning from failure is an important life lesson. Sheboygan North helped its student body understand that by covering something others might not. A universal truth is that students often wonder about items teachers have on their bulletin boards or desks. The yearbook staff at Lewisville decided to get some answers as to the weirdest things on teachers’ desks. The answers became a mod in the faculty mugs section. A short explanation accompanied by a COB photo of the item makes for some fun reading and probably answers questions numerous students in those teachers’ classrooms might have had. The college sweatshirt is a fashion staple of high school students. 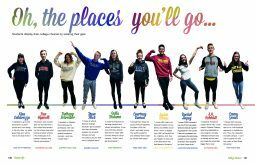 Why not use that to show where seniors are headed following high school rather than an overdone map of the United States? 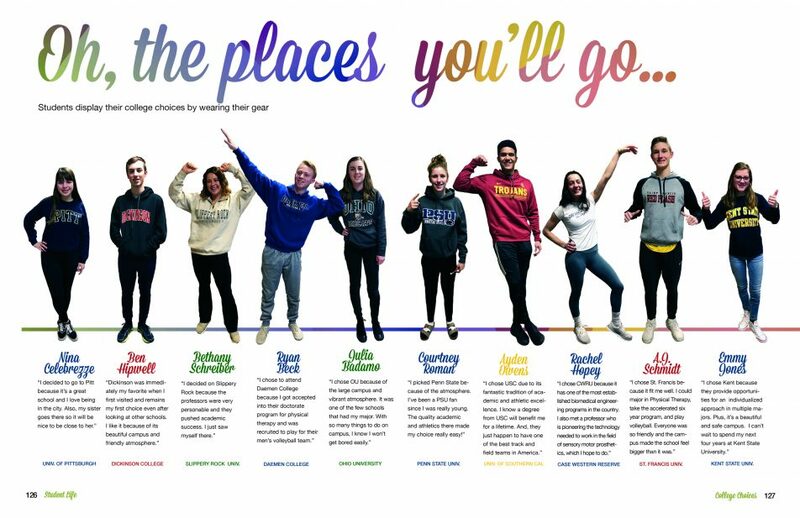 The Safari staff found 10 students headed to various schools from coast to coast and showcased the traditional college sweatshirt with the students saying why they chose their next educational stop. The COB photos help with a very clean design for this spread. There are many different types of equestrian arts available for students to be involved in at Westfield. 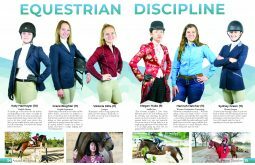 Six students who participate in six different equestrian disciplines explain their particular sport. In their photos, they each wear the specific uniform of their sport. This is a very well-done explanation of a not-often-understood sport. Students living in Atlanta, Georgia, are used to heat and humidity; but a solar eclipse, hurricane, snow, freezing temperatures and a boil water advisory due to a water main break all in one year might make them think the Apocalypse was near. 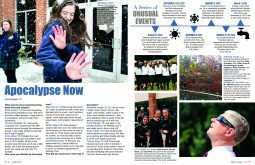 Photos of students in the snow, experiencing the eclipse and damage from Hurricane Irma and a timeline of the out-of-the-norm events are accompanied by a collection of memories from students who experienced the various oddities. This is a great spread to help students at the school, years from now, remember the year of strange things. Lucky are the high school yearbooks that have amazing junior high/middle school programs feeding them. Such a strong program is the yearbook at Woodland Junior High. Alternative coverage in the panels of mugs included lots of great questions, offering a deeper insight into the student body. The staff also used their theme colors and circles as accents with the extra coverage. 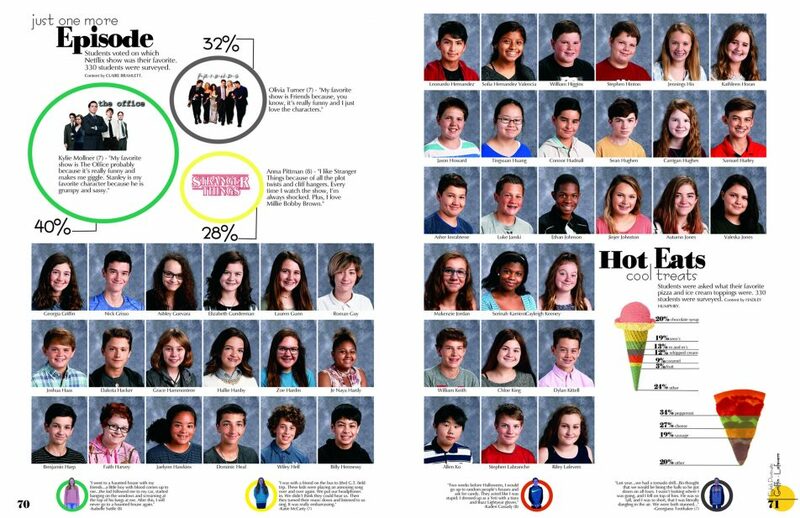 The ice cream cone and slice of pizza on the right side take on the theme colors to differentiate percentages representing the students’ answers. There are high flyers at every school. 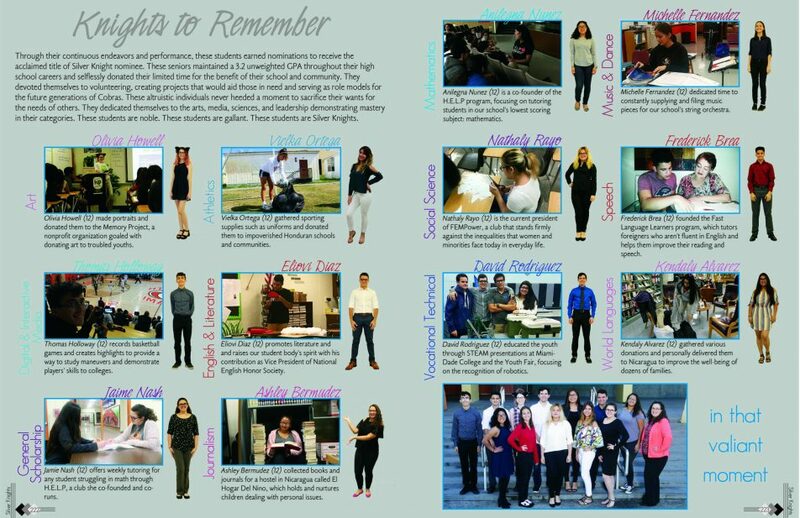 The Decapello staff took 12 students who were named Silver Knights for maintaining a 3.2 GPA throughout high school who and donated their time to help the school and community and showcased them and their volunteer work. So often we know students get academic and athletic awards for their work, but we don’t always know what that work was. A cutout portrait of the student and a candid photo of their volunteer work with a short copy block help us see and understand the amazing work these students did to win their awards. 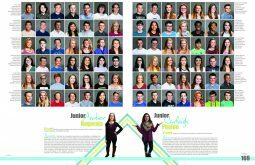 This is a great way to expand academic coverage in the yearbook. Theme: "Speak of the Devil"
What’s in a name? Everyone’s got one, but there are always a few, in every school, that you’d like to know how that person got that name. 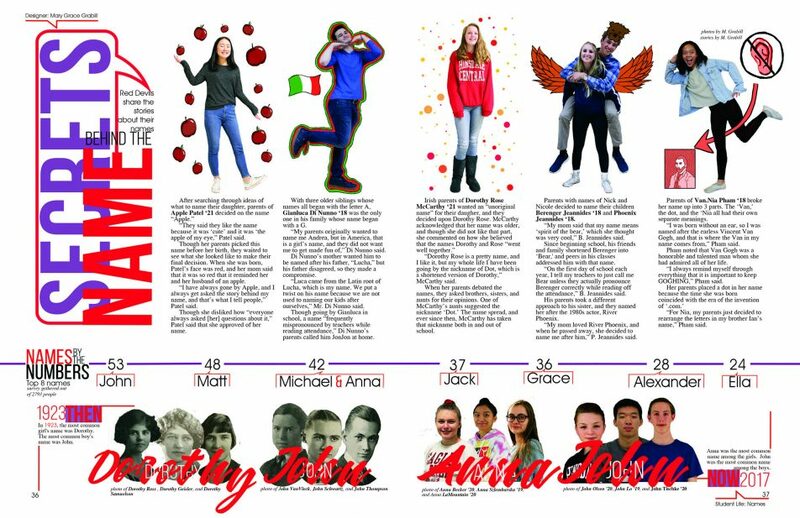 The yearbook students at Hinsdale Central found five students with interesting names and did a short story on each student explaining how their names came about. Since this is also their 75th anniversary book, the staff members also looked at popular names from 1923 and today. They also surveyed the school to find the most popular names enrolled at the school. The most popular boy’s name in 1923 was John, and it still is today at Hinsdale Central. 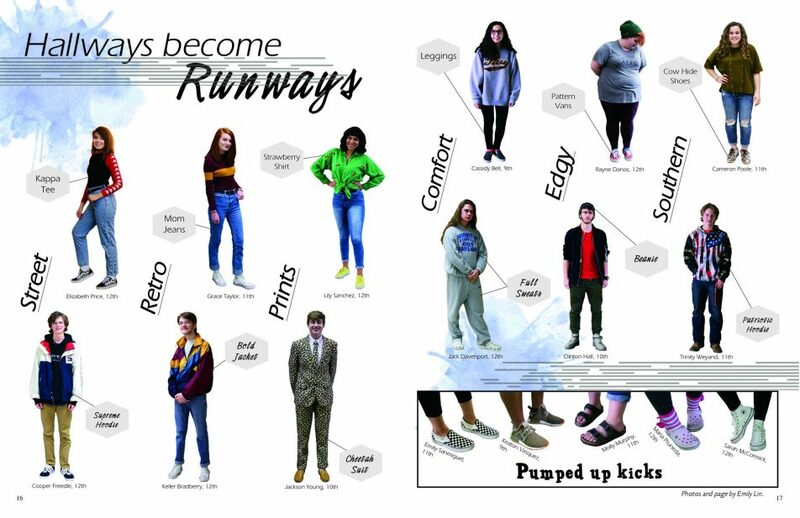 The children of alumni look at their parent’s high school yearbook and ask, “Mom, Dad, did you really wear stuff like that when you were in high school?” The Antler staff listed six genre of clothing students wore at their school then found a guy and a girl to model those fashions. The photos have the backgrounds cut out, drawing all attention to the student and clothes. 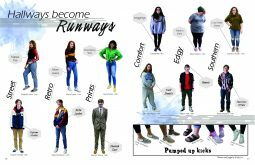 Alternative coverage featured shoes students wear to school from Birkenstocks to Crocs. One day in the future Jackson Young’s children are going to ask him if he really wore a cheetah print suit and tie. In their 20th anniversary book, the South Paw staff included amazing chronological coverage of the current year, but also looked back over the past 20 years. As part of their weekly coverage, the staff went back to look at memorable events that happened during the last 20 years during that week. From the first iPhone being announced to the impeachment of President Clinton, the alternative coverage on the spreads had a great walk down memory lane of things that happened during the lifetime of the school. 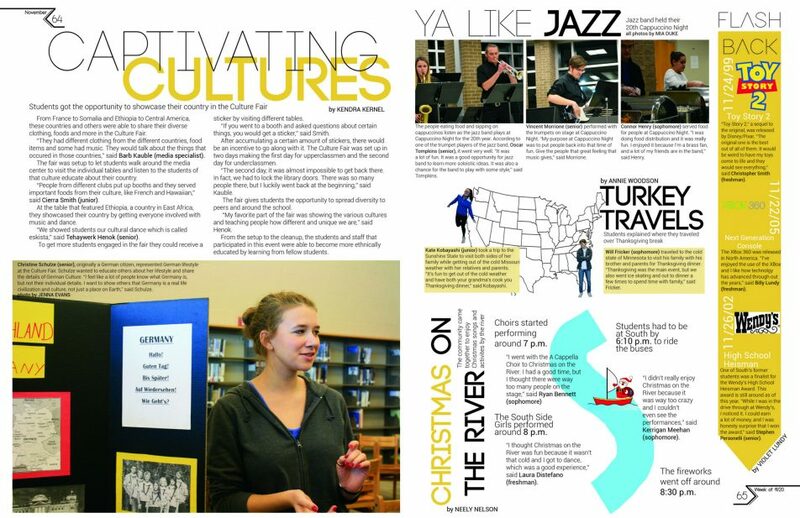 During the week of Nov. 20 there was a Culture Fair, Thanksgiving travels and musical events. Historically that week “Toy Story 2” was released in 1999, the school had a Wendy’s High School Heisman Award finalist in 2002 and in 2005, the Xbox 360 was released. This is fun alternative coverage and a great way to share the history of the school and what was going on in the world at the same time. We’ve all been there. We’ve dropped our phone and for a few horrifying moments, we hoped and prayed the screen didn’t crack. 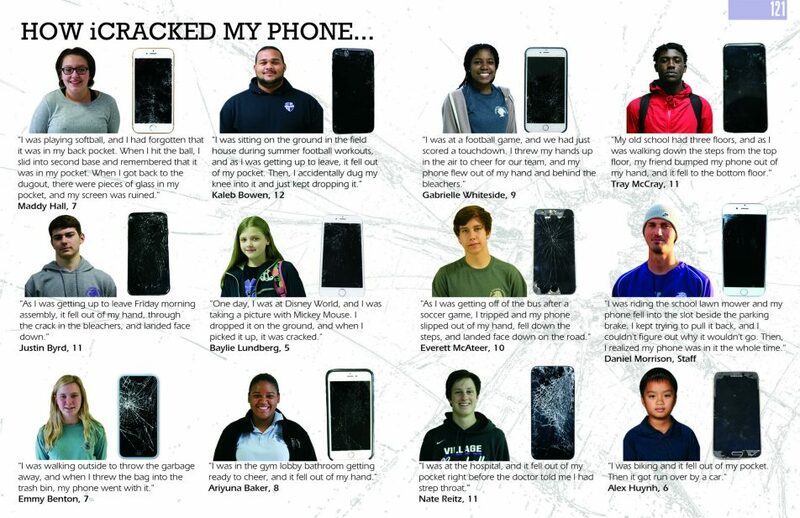 We all also know someone at our school who has a cracked screen and maybe a good story to go with it. 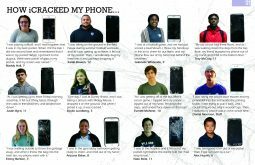 The Excalibur staff collected stories from students in their K-12 school and along with informal portraits of the students, the cracked phones were photographed and included with the story of how the phone was broken. 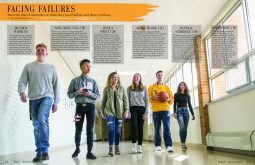 Just because something happens often to many students doesn’t mean it can’t be a good topic for a yearbook spread. Theme: "What's Within You? 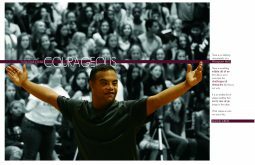 Find Your Maroon"
Having an attractive, simple and effective design utilizing a strong photo is the best way possible to open a yearbook. The opening of the 2018 Raging Bull uses a photo of a student that has been shot with very shallow depth of field, drawing attention to the student. Then, the color has been desaturated from the background of the crowd at the assembly, further drawing attention to the student in the foreground. The implied motion coming across the page from left to right and the use of white space on the right side draw attention to the block of theme copy very effectively. 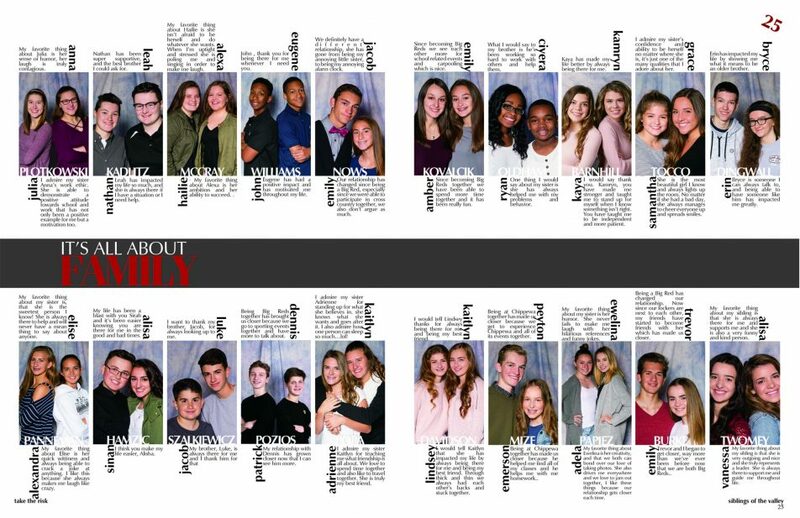 In what is an annual tradition in the Talon, the yearbook staff at Chippewa Valley High School features the siblings who attend the school together. 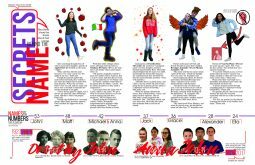 Using two double-page spreads to get all 36 groups of siblings included, the staff used posed photos and the students’ responses to questions about their sibling relationships or advice for each other. This increases coverage and shows what a family feel the school has – literally. 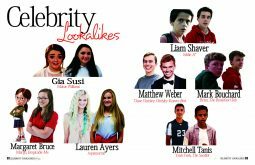 Have you ever heard you look like someone famous? Watching a movie, walking down the street or looking around the classroom, we see doppelgangers everywhere. 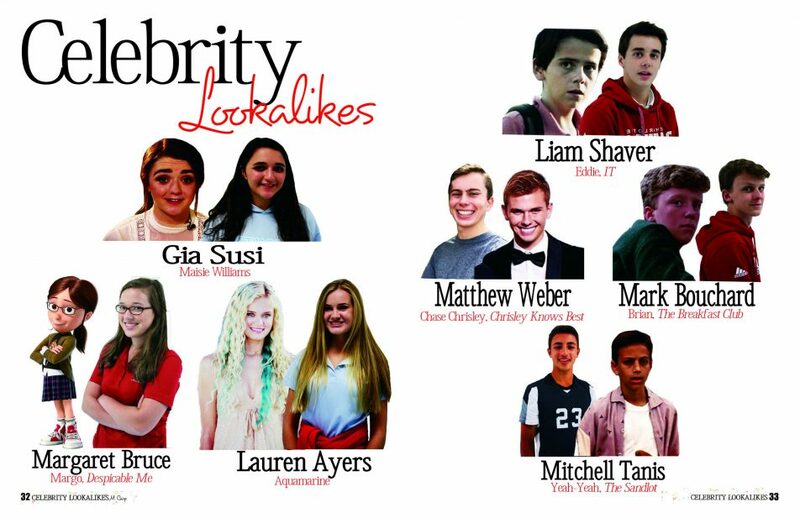 The staff of the Signet II found students who look like celebrities, including an animated character. 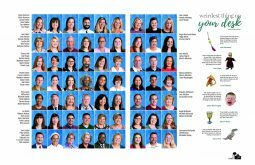 Finding students who look like faculty members, or maybe students who look like students from years ago for an anniversary book, can provide fun coverage ideas and is a lot of fun for students. Try to put as much information as possible about who the character/celebrity is to help jog the memory years down the road. So many schools near the Atlantic and Gulf of Mexico had major issues with hurricanes near the beginning of the school year. 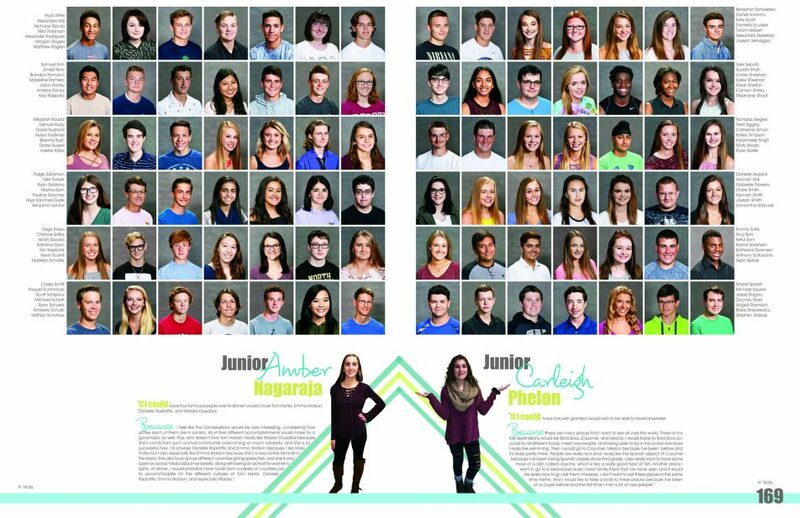 How students dealt with the devastation has to be included in the yearbook’s coverage. 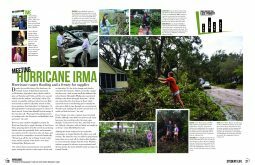 The staff at Seminole High School in Florida covered the cleanup students did following Hurricane Irma in September. 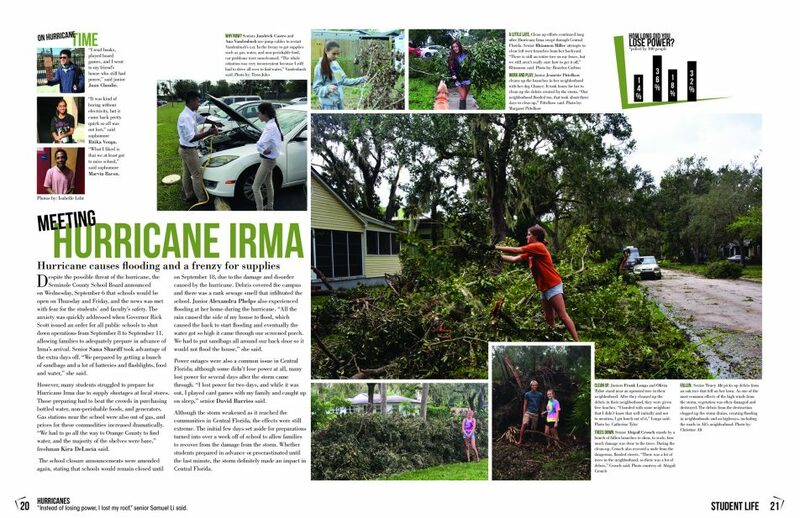 Coverage included photos of students cleaning up fallen trees and debris from their yards, how students helped their families prepare, how students spent their time during the week without power, and the struggle between their local school district wanting to have school and the governor of Florida choosing to cancel all schools in the projected path of the hurricane. Tragedies and natural disasters can’t be ignored in the yearbook. 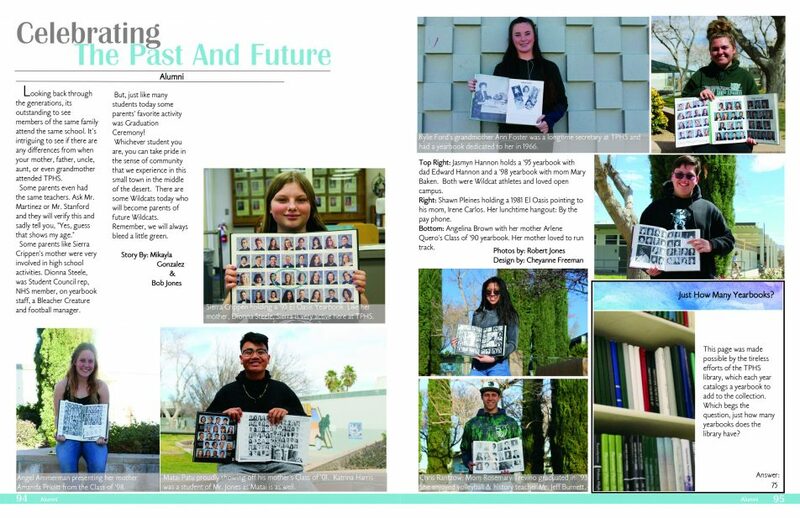 Helping readers learn more about their fellow students is part of what a yearbook should do. 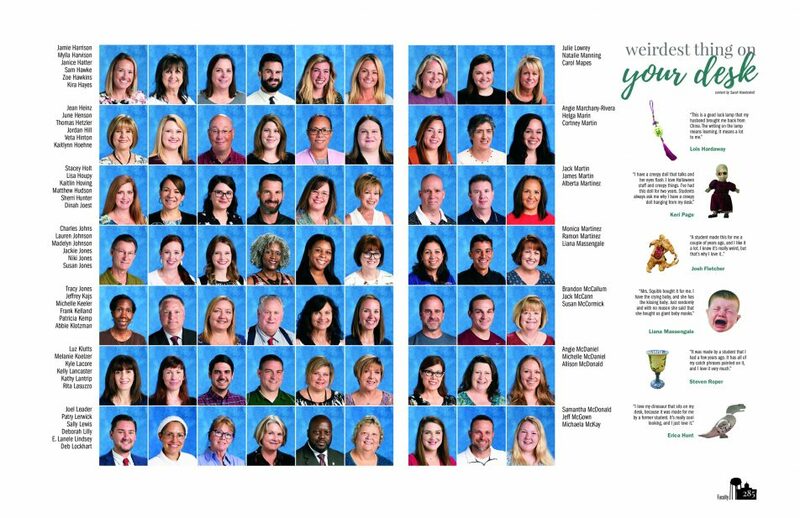 Utilizing student profiles in the mug shot pages is a great way to highlight students, expand coverage and break up what can become the monotony of page after page of photos. 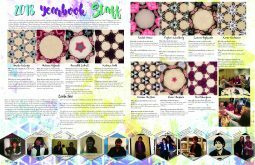 The Emerge staff used students’ answers to questions and a posed COB portrait of the student along with theme-related geometric shapes to provide an attractive expansion of their student coverage.